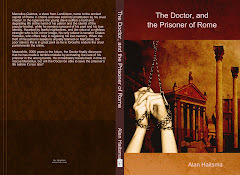 Part of Series: A Murderous Feast is part of a series called A Timelord and his Madman, but can be read as a stand-alone. The series include: (1) His Silent Mind, starting from the events of the End of Time, but with an alternative twist that the 10th Doctor was not forced to regenerate. (2) Judoon Justice. Search the tags to find the previous posts. Synopsis: The 10th Doctor and the recently revived Master arrived in an ancient Roman town where they are invited to a dinner party where the guests tend to disappear even before the first course is served.